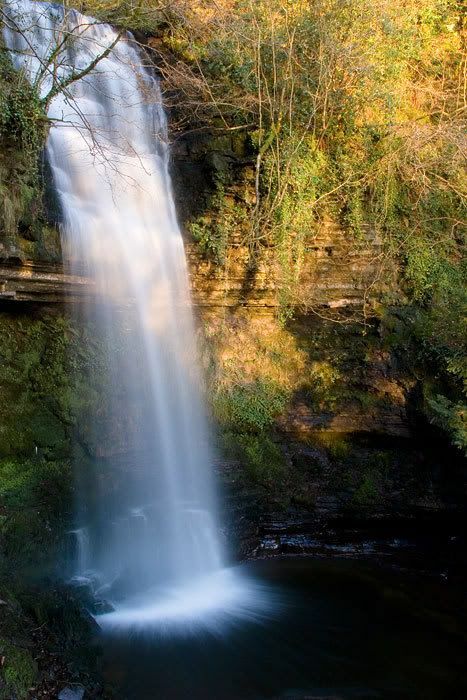 To stand beneath a waterfall is to be inundated, overpowered by the descending cascade of water. Who can stand against such power? Think also of how that water came. It was from a higher plain. This river flowed unceasing to its sudden descent and the river continues its free flow to inevitably come down upon. Once the power of the falls has carried out its duty, the water then is in a calm eddying state until it flows on again to other destinations. Stand back and see the beauty of the scene as the mist hangs about, a ready reminder of what has happened. The continuous sound of the waterfall reminds us the river is still flowing to do its work, unencumbered by an obstacle, a river of water clear and cool to do its refreshing best. In an even more magnificent manner God’s river of grace descends to us from that far higher plain of heaven itself. With simple words a thunderous declaration is made in our baptism as we receive the waters from above. We are washed clean and regenerated. Descending grace has its ongoing impact in refreshing communion and the precious water of life in the Word. For the waterfall to have its effect and even to exist there must be that river that ever flows from above. And ever is it with God’s grace and mercy and love. Jesus had been in the desert for 40 days and 40 nights without food. He must have been extremely hungry when Satan approached Him! Always expect Satan to tempt you in your weakest moments. He said to Jesus, “If you are the Son of God, tell these stones to become bread” (Matt. 4:3). Jesus failed to respond to this temptation, so Satan attempted pride (v. 6). With another failure Satan “upped the ante” and offered Jesus greater things than food, He offered the world. He said, “all these things will I give you, if you will fall down and worship me” (v.9). With this statement, Satan finally arrived at the real issue: “Fall down and worship ME.” All sin stripped of its glamour and laid bare is the dethroning of God to make some THING (living or non-living), a god. Satan can offer you only THINGS; nothing more. Jesus offers you abundant life; life to its fullest (John 10:10). The life Jesus offers you has promises for both the present life and the life to come (I Tim. 4:8). People are foolish. They look for life and peace in THINGS, but Jesus says that you can have life and peace and joy with or without things (Matt. 5–7). Paul accepted what Jesus had to offer and said of himself, “I have learned the secret of being content in any and every situation, whether well-fed or hungry, whether living in plenty or in want. I can do everything through Him who gives me strength” (Phil. 4:12, 13). THINGS cannot bring life and happiness because they are temporary. Only a foolish person spends his life acquiring THINGS to the neglecting of the life Jesus offers. Jesus once told of such a man (Luke 12:16-21). The man acquired so many THINGS that he had to tear down his barns and build bigger ones. With a sigh of relief, he said, “Soul, you have much goods laid up for many years; take it easy, eat, drink, and be merry” (v.19). “But God said of you; then whose shall those THINGS be which you have provided?” (v.20). THINGS have an end but ETERNAL LIFE is forever. The THINGS Satan offers you are in no way certain because he is a liar. Jesus says, “There is no truth in him. When he lies, he speaks his native language, for he is a liar and the father of lies”(John 8:44). Satan cannot offer you anything without telling a lie. On the other hand, Jesus is TRUTH (John 14:6). Jesus cannot promise you anything that He will not or cannot fulfill. In NT times in Luke 7:44 Jesus says to Simon, “I entered your house, you gave me no water for my feet…” showing that the custom was still in vogue. Jesus then uses that custom on Maundy Thursday evening to give an ‘example’ ὑπόδειγμα to His disciples. It was a teaching illustration. This is in Jn.13. It was not before the meal, but during it that Jesus in v. 5 rises from the meal to give the lesson with a visual aid. They call Him“Teacher and Lord ” v.13. If He as such then washes their feet ἐγὼ ἔνιψα,they also aught to. In v.16 He reminds them of the lesson of servanthood.